All of the dogs we are offering as started have no issues with health or temperament and can be seen in the field. All of them have been hunted, have no hunting or personality issues, and will make a wonderful hunting companion and family dog. All are also up to date on all shots and wormings. Many breeders are producing dogs but few require as much from their dogs before breeding as we do. We expect each dog to start out with a great pedigree, be finished in the field on wild birds, and to be free of all health issues. We also require our dogs to have proper confirmation and have wonderful personalities and temperament around the house and kennels. We will not breed a dog to simply produce pups and most of our sires and dams are three years old and older prior to producing their first pups. All of our pups are fully guaranteed for health, performance, and we provide free training assistance if the owner of the pup participates in the training sessions. We encourage all perspective buyers to take the time to meet, handle, and watch the parents work in the field prior to purchasing a pup so they can see the product on the ground. We are breeding to improve the qualities within our dogs and are producing exceptional foot hunting dogs that are also great family companions. You can contact us by phone at 724-317-6729. Please leave a message if you do not get us and we will return your call as soon as we get in from the field. ON POINT OUTFITTERS LLC. RESERVES THE RIGHTS TO ALL FIRST PICKS OF THE LITTER OR TO MAKE A PICK IN A LITTER AT ANY POINT IN THE PROCESS. ALTHOUGH WE DO NOT NORMALLY EXERCISE THIS RIGHT, WE DO RESERVE THE RIGHT TO DO SO. LITTERS ARE RESERVED BASED ON A $100 DEPOSIT AND THE ORDER IN WHICH THE DEPOSITS ARE RECEIVED. We currently do not have any puppies available. 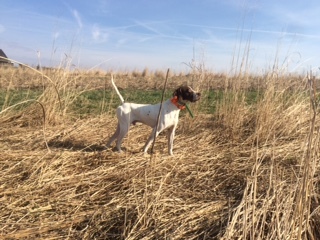 We are planning several English Pointer and a English Setter Litter in fall/winter of 2018. Please Contact Mike to place a Deposit or for more details.